Few contemporary symphonic composers deserve as high acclaim as Einojuhani Rautavaara. (...) Not since the Sallinen Third Symphony have I been as impressed with a new symphony as I am with No. 5. A truly great masterpiece. Rautavaara (...) vermag mit allen stilistischen Mittlen (...) seinen Werken eine suggestive Anschaulichkeit zu geben. (...) Das Leipziger Radio-Symphonie-Orchester unter Max Pommer musiziert auf allerhöchstem Niveau. Devant ce disque remarquable, on ne peut que souhaiter que Pommer nous donne à entendre d'autres partitions de ce grand musicien. 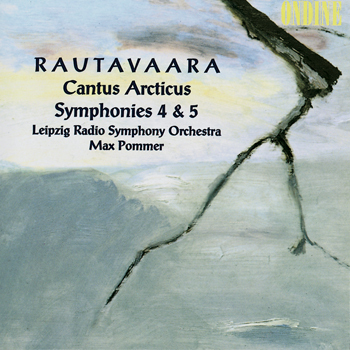 This CD features one of the most frequently performed Finnish orchestral works of all time, Cantus Arcticus - Concerto for Birds and Orchestra by Einojuhani Rautavaara, which is coupled with Symphonies Nos. 4 and 5. This release is the second volume in a cycle featuring the complete symphonies by Finnish composer Einojuhani Rautavaara. The recordings were made in Leipzig in 1989/1990, with the Leipzig Radio Symphony Orchestra led by its then Chief Conductor Max Pommer, and originally released in July 1990.